The name gives it away but in case it wasn't obvious 888 Ladies Bingo is a site that caters for the needs of the female players of all ages. The site clearly sets out their stall with the demographic they aim to target but it's by no means exclusive so if you are male that doesn't mean that you shouldn't play, in fact if you are a single guy we can highly recommend playing here, as you will be guaranteed lots of female roomies to talk to.. and you're sure to find other likeminded men playing too. In fact this is a site for the bingo aficionado who is keen to take advantage of the superior software and playability gifted by being part of the 888 Group, a leading brand in online gaming. The 888 Ladies homepage utilises a multitude of pinks on a white background, this gives a slightly girly feel whilst maintaining a clean cut and fresh appearance. Well designed and thought out, the site is extremely easy to navigate, meaning even brand new players should have no difficulty finding their way to their favourite games or into the bingo lobby. Unlike other sites that pack out their homepage with busy graphics and promotions, 888Ladies is quite subdued, only showing their very best offers and essential info. This is a welcome change and makes the site all the more appealing. Registration at the site only takes a few short minutes and once you're in it takes mere seconds to start your first bingo game and start enjoying the action. As you'd expect every bingo room is equipped with its own chat room, staffed by genuinely entertaining chat hosts who keep spirits high during the gaming. New members can take advantage of their fab welcome offer and immediately throw themselves into the action. 888 Ladies has been around for a long time and this is maybe where some criticism might be levied. Despite offering a fresh and vibrant gaming environment, some of the promotions aren't quite as exciting and seem to remain quite static without anything special taking place. 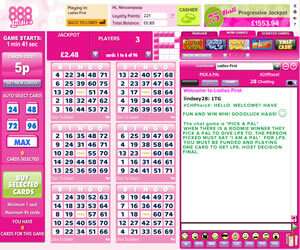 However, this has been improved more recently by involvement in the Joy of Bingo Network which has granted players at the site access to some larger linked promos, making those exclusively at 888 Ladies seem less samey and old hat. The 888 Ladies range of bingo games is mainly focused upon 90 ball and 75 ball although there are 5 Line games featured too, for those who like the pacey Swedish game. Free bingo plays hourly and there's the chance to win up to £500 without parting with any cash at all. The 888Ladies team also offer tickets from 5p to £1 which allows for players with a range of budgets to participate and get involved in the games on offer. Their side games suite is relatively extensive, as you would expect from a site that is part of a larger online gambling company and includes classic casino games, card games, slots and scratch cards. There is the opportunity to play for progressive jackpots in many of the slots, with mega jackpots on offer in these instances. 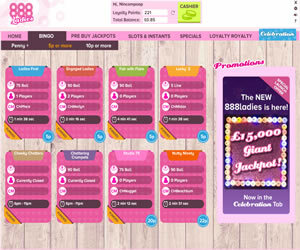 Quite girly and extremely vibrant, 888 Ladies is a site where you'll be sure to have fun and their involvement with the Joy of Bingo Network and the fact that they come from one of the big boys of the industry means you can trust and rely on their brand to keep the quality coming. 888 Ladies Bingo offers 90 ball and two variations of the 75 ball game at their site. There is both pattern and multi-line (five line bingo) as 75 ball offerings at this brand. 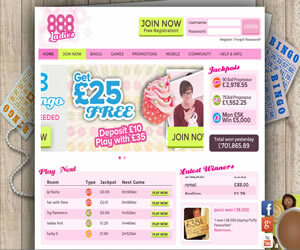 Alongside these the site boasts a jam-packed portfolio of instant win games and mini games to their players. Before being eligible to withdraw from your 888 Ladies account you must first have deposited at least £20 at the site. All deposit bonuses have wagering requirements of 2x the amount of deposit and bonus received but you can withdraw prior to meeting these requirements but bonus money will be lost.